I can’t seem to live a life with horses without also somehow living a life with dogs. Whether they’re barn dogs or house dogs wishing to be barn dogs, I always have a story or two to share. Today is no exception. First off, there’s my little Schnauzer, Betsy. Though she weighs all of fourteen pounds and consists primarily of whiskers and a stubby tail, she imagines herself to be a Doberman. Lacking any herding ability or the canine commonsense to stay clear of hooves, she’s confined to the house and patio. Once in a while, however, she’s permitted to patrol the barn area, a duty she assumes with the self-importance of a German Shepherd. About a week ago, during a skirmish with a lizard she was determined to keep from invading the stack of hay bales, she cut her paw. That led to some obsessive licking, which then brought forth an infection, requiring several trips to the vet clinic. Betsy was prescribed a course of antibiotics and twice-daily foot soaks with an antiseptic solution. What she found even more distasteful, if not downright humiliating, was that she was also required to wear a rigid collar strapped around her neck to prevent her from licking her paw. Yes, she was forced to wear The Cone of Shame. Immediately her demeanor changed. She seemed to think that every other dog was looking at her. And laughing. To help lift her spirits I rummaged through my craft supplies, found some construction paper, and made her a modified Cone of Shame. It wasn’t quite as cumbersome yet it still did the job. 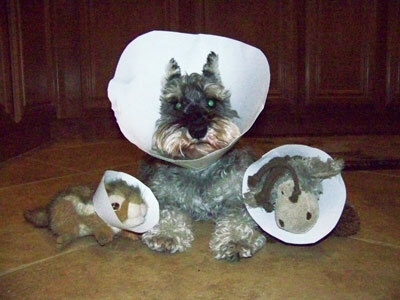 Then, to make her feel even better, I rounded up a few of her favorite toys and made cones for them, too. I know. Either I’m becoming one of those nutty people who worry about their dog’s psychological well-being or I have too much free time. Maybe both. Then I got a call from my parents. Perhaps you’ll remember that their ranch dog—I can’t help but roll my eyes while I’m typing that description—is a big ol’ dopey Labradoodle named Skippy. During his puppyhood, which curiously lasted about four years, he displayed a propensity for chewing up stuff. It went far beyond leather tack, curry combs, sweat scrapers and spray bottles of Show Sheen. Skippy also ate through the seat covers and seat belts on the ranch truck. Twice. He was just as destructive inside my parents’ house. Remote controls for the TV and countless pairs of reading glasses met their demise in the jaws of Skippy. What had he done this time? My mom had left $35 on the kitchen counter, payment for a local guy who tractors the riding arena. I guess there’s nothing quite like the taste of paper money, because Skippy stood up on his hind legs, grabbed the stack of bills and began chomping away. In a few moments he’d reduced the $35 to a pile of green and gray confetti. My parents sounded a little too nonchalant as they recounted this tale. Me? I was astounded. To my estimation, that brought the grand total of Labradoodle destruction to around $1,000. Well, $1,035. “Oh, but he didn’t eat the money,” my dad said in defense of his dog. Well then, that makes such behavior so much less… felonious. Fortunately, my mom was able to piece the tidbits together, taping them to a piece of paper like a jigsaw puzzle. Then she took her little arts ‘n crafts project to the bank where, amazingly enough, she was able to swap it for fresh, non-slobbered money. Maybe my mom has too much free time, too. It is so scary how the vast majority of horse people are completely clueless about dogs. And yet they all have dogs! It is rare to find a person who really “gets” both species. thanks for the article.I love dogs and horses too. @nuna, yobeezwax, FL (clever name, that), the same is also completely true of “dog people” who happen to own horses. They also are completely clueless about the equine species and somehow think that the horses’ reactions and behaviors will be just like their housepets. That kind of thinking can and does get dog people killed. Rarely is the reverse true. @Connie – I totally agree with you. I feel bad for the ANIMALS in both cases. My dog acts like Betsy. She tried to beat up a german shepherd once.Yhe dog I had before was like Skippy- shredding everything. He destroyed our couch.